What you see in the illustration below is called the transformation sequence. It is the most beautiful puzzle man has ever encountered, yet it is not made by man. It is a puzzle that was handed to us by mother nature. All the pieces of this puzzle are spread out in the world that we live in, we can find all the pieces of the puzzle by looking in many different directions, all within our natural environment. It took me one year to solve the part of the sequence that you see in the image below, plus a few other parts that are too small in the image to see, and there have been quite a lot of remarkable discoveries along the way. You will soon get to learn everything about this sequence, and the role it fulfills in the world around us. First we need to partially change the meaning of a word, which is the word 'vortex'. We are going to extend the meaning of that word. A vortex was said to be a movement within a fluid in which the flow has a rotation. We however are going to add more different movements to the meaning of the word. On this website, a vortex can be a rotational vortex or a non-rotational vortex. The reason for why some non-rotational fluid movements are added to the meaning of the word is that some non-rotational movements share some of the same characteristics with the rotational movements, which will be revealed and explained on the coming pages. What you need to anticipate before reading these pages is that whether the movement is rotational or non-rotational, we are basically looking at another form of the same thing, which is why these movements belong to the same category of observations. The shape in the image above is called a 'vortex'. Although the vortex in the image above was found by multiple observations within our natural world, it is not a vortex shape that you will find within this natural environment as a complete shape exactly as illustrated in the image. This is because the image looks like one continuous shape, but it is composed of different shapes fitted together. For what you see in the image is a huge vortex composed of multiple smaller vortices. There are many basic types of vortices that can be observed in our natural world, and these vortices are made to fit together like one great puzzle. But you will never see the entire sequence and all the steps as a whole in our world, we sometimes see two or three steps together, but no more. If the entire sequence could be observed all at once than we human beings would have made this discovery a long time ago. Every vortex in the sequence has a unique shape, and a unique path of movement. Every vortex in the sequence has a unique position within the sequence, a position in between other vortices that also take in their own unique position. There is a strong logical order for these vortices. I've given all these different vortices a unique name, one name for every vortex type. These names are not permanent names, they might be changed later, but I need them for now to be able to indicate what particular vortex I'm refering to at any given moment. This image doesn't show all the vortices, but it only shows a limited range of the sequence. A wider range of the sequence has been discovered, and so a larger number of vortices. The total number of vortices is way larger than 5, 6 or 7. I'm hoping to find many more of the remaining vortices of the sequence within the coming years using the help of anyone who visits this website. The transformation sequence is not the common name it will hold forever. It still needs a shorter, more practical name. Yet it is not I that will name it. Whoever solves the math behind this sequence, whoever finds the equation, that person will be the one to name it. To explain how these vortices appear within our real environment, and how these vortices connect to one another, we first need to look at a set of examples that show how these same individual vortices appear in our environment when they are not connected to other vortices. I will also give you a short introduction about what vortices are. Vortices are shapes and movements that we can observe anywhere within our environment. A vortex is a movement of mass within a gas, liquid or solid that has a unique, distinctive shape, which can include or not include a rotation. Many different types of vortices can make many different types of movement, and these movements form in most cases a recognizable shape. If you remove the plug from your bathtub for instance, then what forms is a whirlpool, a rotating vortex that forms a spiral at the surface of the water, with a rotating tube connected underneath. A hurricane forms this same kind of spiral as the whirlpool does. When a droplet of water impacts on a water surface, an elongated vortex emerges from the water surface as a counter-reaction to the forces of the impact. When an airplane exceeds the speed of sound, a cone of vapor sometimes emerges close to the tip of the aircraft. A waterspout is an example of a rotating vortex above a lake or ocean. A smoke ring can be made by blowing cigarette smoke out of your mouth. These are all examples of vortices that we've all been familiar with, simply by living on this planet and observing the world through our eyes. We've seen many of these shapes, but until now we not been used to consider them belonging to the same group of things, we had still not learned about the connections of these shapes. These hidden connections will be revealed in the text ahead. Vortices can occur in any type of medium, which can be any type of gas, any type of liquid, any type of solid or any type of plasma. And vortices can also occur at any possible size. Vortices can be be microscopically small or astronomically large. In the image above you see only vortices with a size in between microscopic and astronomical. But spiral patterns for instance can also be seen under a microscope or through the lens of a telescope. A spiral galaxy is another example of a vortex with a rotational flow. Some vortices are shaped like a spiral, therefore these vortices are called spirals. There are several different types of spirals, which all have a unique shape. Yet when you see a spiral of one particular type, you might sometimes see that same spiral with one spiral arm, and sometimes with two spirals arms. These are not two different types of spirals, but they're still considered to be the same type with the same name, yet in a different configuration. The spiral type in the image above is called the 'swirl'. Both the left image and the right image is an example of a swirl. Yet the left swirl has one spiral arm, the right swirl has two spiral arms. The left vortex is called a single spiral, the right vortex is called a double spiral. Vortices of one type can also look different because of different length, width or height. A vortex of one type can sometimes be more elongated or shortened, thinner or thicker, wider or narrower. This mostly depends on the medium in which a vortex can be found. The image above shows three vortices that are called amplicones, with different proportions and thus different looks, yet these are all vortices of one and the same type. Take a look at the vortex in the image below. The image shows a vortex ring that is formed just after smoke has been ejected from a tube. The smoke forms a toroidal spiral. It is a type of vortex that on this website is called a 'revolute'. Some of these vortex rings have a closed roof, others have a hole in the center, this is one that is closed. Vortex rings are a familiar phenomenon which most of us have seen before. Most of the times when you see a vortex ring, you only see one vortex, not connected to any other vortex. The vortex in the image below is an unconnected vortex ring, thus only one vortex. Now look at the next image below. The image shows a plunger being ejected from water. What forms underneath the plunger is a water vortex. It is a type of non-rotational vortex that on this website is called a 'pylon'. The image only shows one vortex type. The pylon is not connected to any other vortices. Again look at the next image below. The image shows a water droplet resting on a surface. It is a type of non-rotational vortex that on this website is called a 'bulb'. You might not think of a water droplet as a vortex, because a water droplet does have shape, but it does not show any apparent movement in its resting state. Yet this water droplet does belong to one of the puzzle pieces in this sequence. It will be shown later that this water droplet behaves to some extend like other vortices within the sequence. Most of the times when you see a bulb, you only see one vortex, without any connections to any subsequent vortices. The vortex in the image below is an unconnected bulb, thus only one vortex. The next image is one of a tornado. There are a few types of tornadoes, with somewhat different shapes. The one in the image below is shaped like a vortex that is called an 'amplicone', which is yet another unique type of vortex. Most of the times when you see an amplicone, you only see one vortex, without any connections to any subsequent vortices. The vortex in the image below is an unconnected amplicone, thus only one vortex. The last image below shows a trail of dust forming a spiral after a plane's wing has crossed the air near the ground. The spiral that forms is one that is called a 'swirl', and in this case it is a spiral with one arm. Most of the times when you see a swirl, you only see one vortex, without any connections to any subsequent vortices. The vortex in the image below is an unconnected swirl, thus only one vortex. Now look at the next two images shown below. The left image shows a mushroom cloud created by a large explosion. The right image is a photograph of a vortex ring in a homogeneous fluid. Both images show the same type of vortex, with similar shape, yet at a much different size and in quite a different phenomenon. One is an explosion, the other is rapid movement of fluid. At first, both images appear to show only one vortex. But we've seen the previous examples of the other five vortices, and there are two vortices in those examples which we recognize in these two images, namely the revolute and the pylon. Those two vortices were shown as single vortices in the previous examples, but are connected in these examples of mushroom-like vortices to form one larger vortex. This is not uncommon. Vortices of different types can exist in a connected state in a similar way as the revolute and the pylon can be connected in the example of the mushroom cloud. More of two single vortices can form one new vortex pair, and they always connect in the same way when they form together. Below is another example of such a connection, which shows the next two vortices in the sequence being connected to one another, which in this case is the pylon and the bulb, both non-rotational vortices. This is one of the first clues that tells us that a water droplet should also be considered to be a vortex type. There are more clues in pages to come that tells us that characteristics of a water droplet are like some other vortices. In the previous example the pylon was connected to the revolute. In this example the pylon is connected to the bulb. Those are the two vortices that the pylon under normal circumstances can connect to. The pylon can also connect to an amplicone and a swirl, but those kind of connections happen much less than that with the two neighbouring vortices, the revolute and the bulb, and only happens in more extreme conditions. The connection of the pylon to the revolute and/or the bulb is the desired type of connection for that vortex, and happens much more often. The next image shows not two, but four different vortex types being connected as one single vortex. The image is a photograph of a vortex as it forms in a rotating cylinder filled with fluid. Here we can recognize the revolute, pylon, bulb and amplicone, all vortices from the previous examples, existing as one larger connected vortex. There are more examples of three or four different vortices existing as one bigger connected vortex, but the greater the number of vortices, the more rare it is that such a vortex occurs in our natural environment. The next example shows the last two vortices in this sequence existing in a connected state, the amplicone and the swirl. The images below are photographs of Kelvin-Helmholtz clouds. I haven't found a good photograph that shows both the amplicone and the swirl completely recognizable, instead I use these four images. The swirl is only partially formed in all of these images. Image by Kr-val (Wikimedia), under CC BY 3.0. Image was converted to GIF anim and green markings were added. Not always do we look in gases, fluids or solids to look for possible connections in the transformation sequence. Sometimes we look at much different phenomena. We can find clues in biology or in human inventions, if there is a logical reason as to why those things relate to vortex movement. The image on the right below show a natural horn (that is the actual name of the instrument). Its shape shows great resemblance with the shape of the amplicone and the swirl, being connected into one bigger shape for the instrument. This resemblance of its shape is not a coincidence. The five vortices that are shown in these examples are all taken from a location of the transformation sequence where sound waves play a major role. This is all explained on a special page about sound, which you will find further ahead. The image on the left shows a chameleon from its side. The shape of the chameleon is that of a bulb, amplicone, and swirl being connected as one larger form. You might not expect this at first, but you'll actually be surprised to hear that the resemblance of this shape with those three vortices is also not a coincidence. You might at first think that there is no relation between vortex movement and biological life, but there is. A partial explanation, and much more examples, is given on the page about biological life. With these two vortices added to the previous examples, we now have shown how the entire sequence, step by step, can be formed by different connections, yet those connections are never observed altogether simultaneously. Most of the times we see a single vortex, no connections. Less often we see multiple vortices, being connected as one. If we attempt to look for all possible connections of multiple vortex types, which we find in many different sources, then we find one big puzzle consisting of a huge number of vortices. It is a puzzle that never ends and in which the possible number of unique vortices is infinite in both directions. By showing how the five vortices can connect to one another through a series of examples we still have not shown how the connections to all parts of that image were found. There are still two shapes, two vortices, that are missing an explanation as to how they were discovered. One of these two vortices is called the 'cradle', which is the largest vortex in the image that encapsulates most of the other visible vortices. One source where this vortex was found was in large nuclear detonations. Some mushroom clouds, but not all of them, develop an inverted funnel shape underneath the head of the mushroom. This funnel shape is a smaller part of a larger vortex that connects two revolutes. It is not the complete vortex, but it is one of the puzzle pieces that reveals the existence of this large hollow vortex. The other vortex that was still missing an explanation is the bridge at the center of the image, the part that connects the two swirl spirals. One place we can find that connection is in the airspace behind some flying aircrafts. When smoke is added to that space as the aircraft flies by, two spiral vortices form with a connecting bridge in between them. This vortex is one example of the center bridge that connects the two swirls. In the theory on this website, that vortex bridge is called a 'troth'. 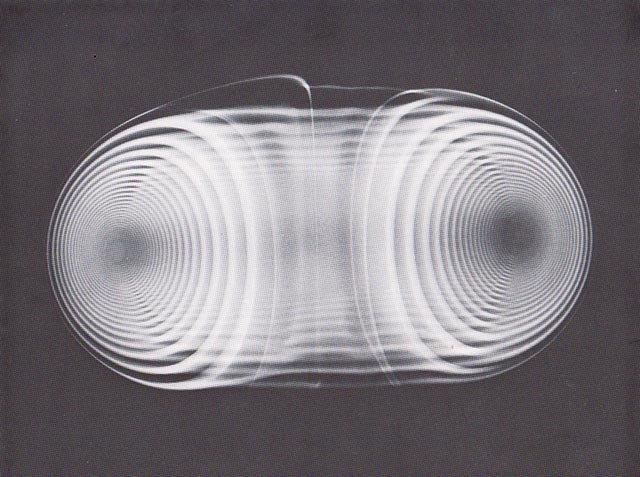 The image below is a photograph of such a connecting vortex. All the seven vortices that we've shown are different vortex types, some rotational, and some non-rotational. All seven are unique, yet some of these vortices belong to the same group. There are groups of vortices that are called 'classes'. Some vortex types that share some of the same characteristics are categorized into one of these classes. The revolute, the bulb and the swirl are called 'spirals'. The pylon and the amplicone are called 'ladders'. The troth is called an 'outer bridge', and the cradle is an 'exterior tunnel'. These, and more vortex classes, will be introduced in the pages ahead. Even by showing examples of every vortex in the image that explains where those parts were found, we still haven't shown or explained the entire transformation sequence. These seven vortices that we've shown here form only a small part of the sequence. The sequence itself is much larger, and continuous infinitely into both directions. A lot more of these vortices will be shown on the coming pages, there you will find explanations as to how they were found, including more explanations for the existence of the seven vortices that were shown on this page. The animated image below shows a larger part of the sequence, with more steps of the puzzle, with more vortices, by zooming in on the regions that were not visible in the previous image. Those are locations of the sequence that will be discussed in the pages ahead. At any time when you are browsing through the pages on this website you can view this same transformation sequence as an animation in a pop-up screen within your browser. All you need to do is click on the far right icon at the upper right corner of this page. It will be useful later because more details about these cycles will be explained and at times you might need to look at the animation to enable you to understand or remember all the information. The question that now comes to mind is, how or why does this happen? Why do some vortex types seem to connect, and why does the total of all those connections combined form one large perfect seamless puzzle? Why is there a logical order for these vortex types, and why do these vortices connect in two possible directions? The answers are found here, on this website. The theory on this website is called the 'infinity theory'. Explaining why the vortex types connect, what the logical order means, and what the nature is of the two possible directions, those explanations is the purpose of this work that is called the infinity theory. Not only does the theory offer an explanation for the existence of this puzzle, but it also presents new discoveries that emerge from the first discoveries along with essential explanations for these findings. The discovery of the unique vortex types that connect into one large cluster of vortices is the starting point for the infinity theory. From here on, many other discoveries follow, which are presented one by one on the coming pages. This discovery does not only help us understand the relation between different shapes and patterns in fluid motion, but it also allows us to understand many phenomena in other fields of physics to a greater level than we did before this discovery. It allows us to understand known phenomena which we humans have been observing for years, plus it allows us to predict new phenomena, which are still yet to be discovered. This website will attempt to explain all of its contents as best as possible, in a way that it is logical and understandable for everyone. This website will also present as much visual evidence as possible for the theories it presents, and will seek for ways to test or proof those theories, where possible in cooperation with anyone with an interest in these scientific puzzles. The vortices mentioned on this page are part of one phenomenon, that links to another phenomenon, which are waves. Vortices and waves combined link to yet another phenomenon, which is dimensions. An introduction to these subjects will be presented on the next page.